Before I start writing this recipe, I must first thank the great Rick Stein for the inspiration – his original recipe can be found here and I would encourage anyone to try it – it’s delicious! This version is quicker, and great for a week night, but I won’t pretend it’s anywhere near as lovely as Rick Stein’s, so please do try his first! 1. Put all of the ingredients for the paste (peeled/chopped where necessary) into a food processor and whiz until they make a smootish paste (you may need to pick out some of the larger bits of lemongrass). 2. Put the paste into a large pan and heat for 30 seconds, until it becomes fragrant. 3. Add the cooked rice, tomato puree, sliced carrot, halved green beans and water. 4. Put a lid on the pan and cook on a medium heat for 10 minutes. 5. In the meantime, finely slice the shallots and shallow fry them until crispy, then drain on kitchen paper and leave to one side. 6. Add the prawns to the rice and heat through. 7. Fry the eggs in a separate pan. 8. 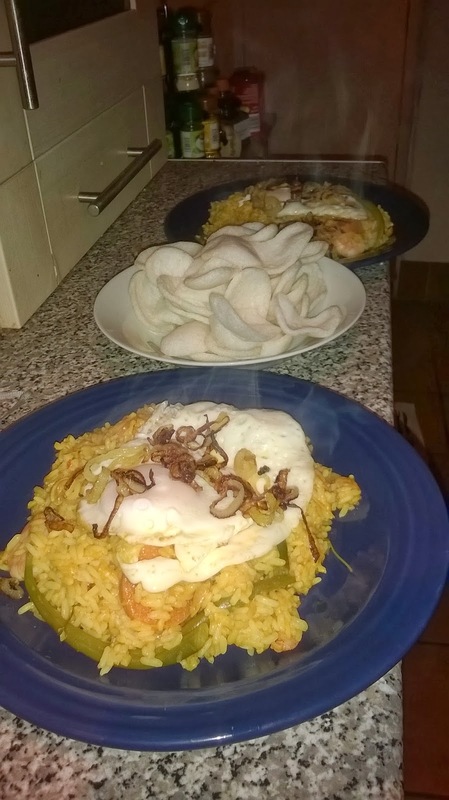 To serve, top a generous portion of the rice with the shallots and a fried egg, and serve with the prawn crackers on the side. Best enjoyed with an ice cold beer, but as it’s only Tuesday we abstained!